With restaurants, it’s all about location. But landing the best site could require the transformation of some unique venues. 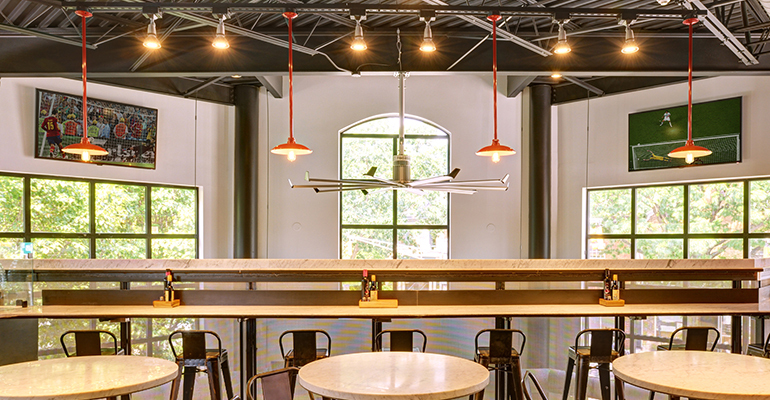 Former banks, gas stations, landmark railroad stations, and even historic school houses can make for beautiful restaurants, long on character. However, these adapted buildings often come with unexpected challenges too. With the right project team, these are hurdles that can be addressed. The result can be one-of-a-kind dining experiences that engage the public’s imagination. Some owners hesitate to consider converting an older, possibly compromised building into a foodservice establishment, since it often seems overwhelming and expensive. Yet in many cases, these “adaptive reuse” projects can be cost effective and serve as greener alternatives to conventional new locations. 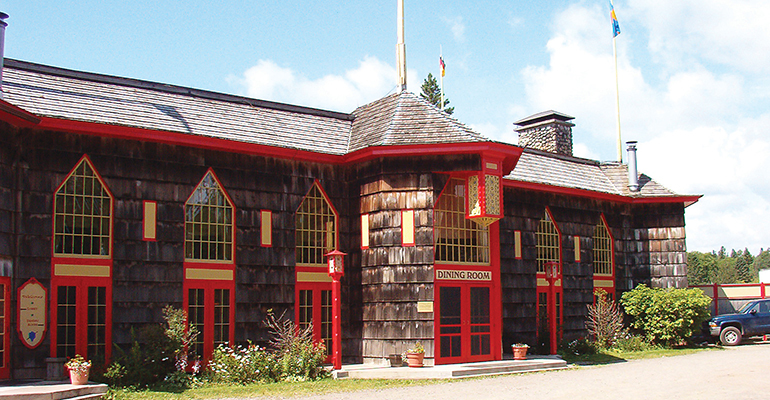 Some buildings also confer instant landmark status, with memorable design features, sturdy bones and other advantages of the structure’s original character and purpose. Consider the case of Tom Grimm and Stalin Bedon. After they successfully launched their original Nomad Pizza venture out of a converted 1949 REO Speed Wagon in 2007 in Philadelphia — complete with a wood-fired oven imported from Italy — they began to discuss opening their third dine-in pizzeria in nearby Princeton, N.J.
Intrigued by the possibility of converting a defunct gas station set in a great location near a local shopping center, they met with a developer group and designer to consider options. It was no easy task. Yet, today, the trendy indoor-outdoor eatery is a modern gem that subtly recalls its original use, with overhead garage doors and clear outlines of the service bays, which were made into large openings for indoor-outdoor seating. Other projects like these may leave even more features unchanged from the original building use. A developer currently adapting a historic stone prison in Ebensburg, Pa., as a new restaurant and brewery will leave the exterior façade almost untouched while carving out dining and tavern areas from the former jail cells inside. Of course, it’s never as simple as it sounds. Projects like this demand a lot of research. Adaptive reuse can be costly: the original concrete or steel structure may have deteriorated over the years, or there may be environmental hazards such as lead paint, asbestos and leaked fuel oil. Local building codes may make the project difficult or even impossible, so experienced teams need to get all the facts straight and crunch construction numbers before starting. Another planning step is to determine if kitchen layouts and equipment are compatible with the building, and if the renovated restaurant will meet all safety and health codes. Is there a chance this building contains toxic materials? Is there adequate room for storage, deliveries, and parking? These questions are the tip of the iceberg, but none are insurmountable. Health and building codes vary greatly among states and municipalities, but running afoul of any state or local rules may lead to project delays, failed inspections, and cost overruns. Small oversights in code matters might mean a planned opening is delayed by weeks, or months. Worst case: the new restaurant never opens its doors. Consider health codes first. Adapting a building to suit foodservice requires compliance with all applicable regulations, even if they contradict each other. Resolution of the regulatory needs can heavily influence design aspects, too. For example, adequate ventilation is regulated in both building and health statutes, so a mechanical system must circulate fresh air indoors while exhausting harmful fumes out of the kitchen. Fire codes present additional hurdles. For instance, most states call for a minimum number of exits based on the restaurant’s size and occupancy, and some require sprinkler systems. There’s ambiguity in many codes, and savvy teams consult their building inspectors or fire marshal long before settling on a design option. 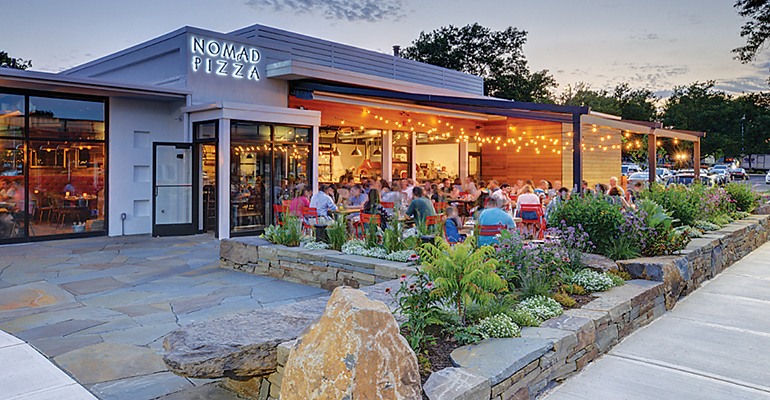 For Nomad Pizza, the owners weren’t sure if costly overhead sprinklers and piping would be required for the chic-casual eatery. They weren’t required for gas stations. Fortunately, the inspector rules that sprinklers weren’t needed because of the occupancy: The restaurant would only be at full capacity a few months out of the year, and only in the warmer months when the garage doors would be open and seating sprawls out into the awning-covered patio. Another key challenge is the Americans with Disabilities Act, or ADA. Along with other codes, the restaurant design must offer wheelchair-accessible tables, parking spots, and bathrooms, and the aisles between tables must be wide enough for a wheelchair to pass through comfortably, for example. Things become even more complicated if the unusual venue happens to be a historic building or landmark. None can grant an exemption from compliance with ADA, however. As the NPS makes clear on its website, “With the passage of [ADA], access to properties open to the public is now a civil right.” Equally unlikely are exemptions or waivers giving restaurateurs a break from fire, health, and building codes. It’s tricky work. Yet, more and more successful restaurants occupy unlikely spaces these days. Some are transformed beyond recognition, but it’s often better to preserve and even showcase the existing architecture. Some interiors highlight exposed raw structural materials, as at the second location of Spanish eatery Despaña in Princeton, N.J., which combines casual dining with a retail delicatessen counter. There, brick and steel contrast with imported Iberian tile in the converted industrial space, awash in sunlight owing to the installation of large-scale picture windows. The result is a venue rich in cosmopolitan character, where patrons sit to enjoy small plates or sample imported olives, cheeses and meats. 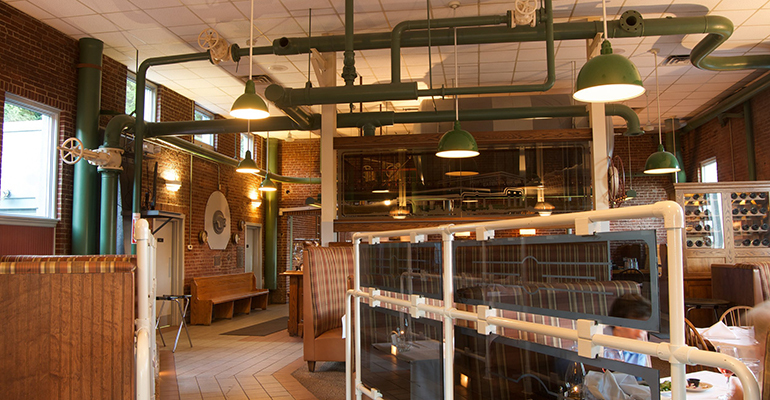 At the Powerhouse Eatery in White Haven, Pa., an old boiler plant has been converted into a historic bar and casual dining spot. Diners enjoy contemporary American fare while sitting among the original hardware — boilers, pipes, and valves — with even more historic touches in the private party room. 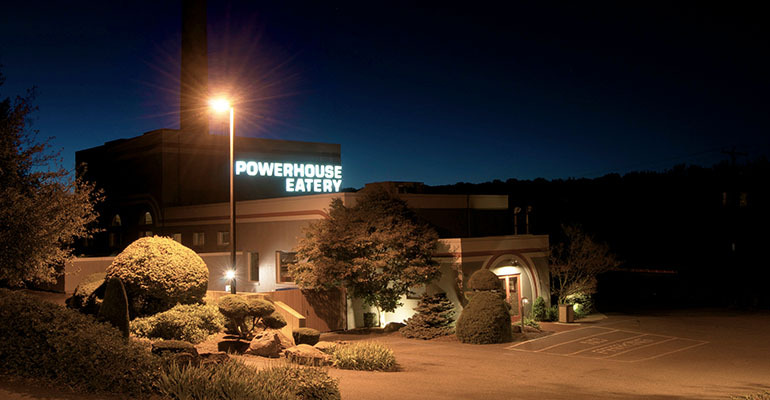 It might seem counterintuitive or even financially risky to convert a gas station or a power plant for foodservice, yet this unlikely approach to site selection often has the Powerhouse Eatery’s “smokestack effect” — a highly visible, memorable and magnetic feature that attracts attention and sets it apart from the competition. In fact, preserving a building that is locally beloved can ingratiate the new restaurant into the community before it even opens, helping to build patronage and establish a unique and profitable business. Joshua Zinder is founding principal of Joshua Zinder Architecture + Design (JZA+D), an architecture and interiors practice headquartered in Princeton, N.J.